This week all roads have led to Wadebridge for the three-day extravaganza known as the Royal Cornwall Show. In previous years, I would have been one of those people frantically getting everything ready for the show and then spending three days in the council pavilion (or ‘cattle shed’, as it is more affectionately known by staff) talking to members of the public about the work of the authority. But not this year! This year, for many more years than I care to remember, I am neither working at or visiting the show. 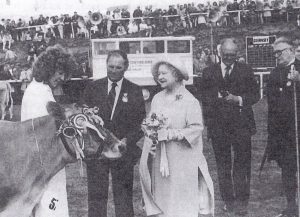 Now, before show enthusiasts castigate me for this shocking announcement, I think it is important to point out that my first visit to Cornwall’s annual show took place more than 50 years ago and I have been a regular showgoer in a variety of different roles ever since. From the eight-year-old watching her mother show their basset hound in the dog show in the 60s (long before tarmac was used on the roads to prevent what I fondly remember as the annual mud bath) to my first visit as a trainee reporter for the Cornish Guardian in the 80s, and then as a member of the council’s team in the mid-80s onwards, handing out stickers and pens to hordes of school children, the Royal Cornwall Show has been an important part of my calendar. 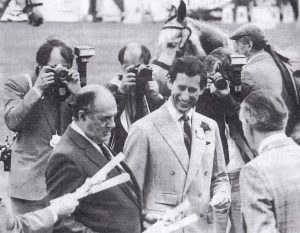 Covering the show as a reporter in the early 80s was certainly very different to today. 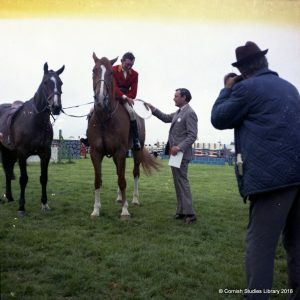 Back then, having lugged my “portable” typewriter to the showground, I spent many hours going round to the various show rings and tents prising the results from increasingly exasperated stewards and then typing them up on sheets of paper with carbon copies ready to drop off at the Cornish Guardian office in Bodmin on my way home. Luckily other Cornish Guardian colleagues selflessly volunteered to do the three-day competitions (thanks Clare, Ray and Alistair for covering the cattle, dogs, sheep and goats), leaving the young trainee to cover the bees and honey, rabbits and cage birds, and the flower and craft tents. Even so, it was hard work – with not even the option of a visit to the beer tent as I had to drive home. Back in those days the local papers prided themselves on covering every aspect of Cornwall’s biggest annual event. 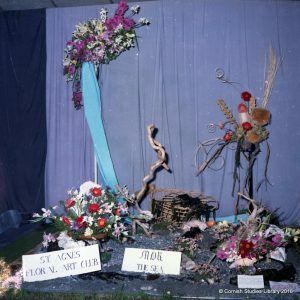 Every single result for every single class had to be published in the Cornish Guardian and its sister publications, the West Briton and the Cornishman, together with colour pieces about all areas of the show – from VIP visitors to the main ring events, and always including the obligatory photo of a young child covered in ice cream. Woe betide the reporter who missed something important or, even worse, got a result or a name wrong! The exhibits have changed too. 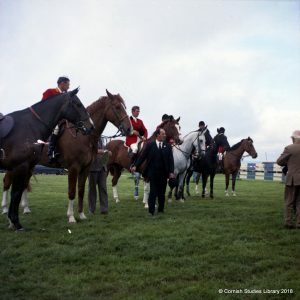 My first Royal Cornwall Show experience working for the council involved frantically trying to keep up with what seemed like thousands of children visiting the stand to grab stickers and any other freebies they could get their hands on. In today’s austere times the freebies have gone, and the council’s exhibit is used as a way of informing and engaging with members of the public. In fact the whole show, now in its 225th year, appears to have a more serious role to play. As well as continuing to provide individuals with an opportunity to catch up with old friends, marvel at the size of the animals, taste the incredible range of Cornish food and drink on offer, and for businesses to promote their goods and services, it also seems to have become the place for making major policy announcements and setting political agendas. This year the Country Landowner’s Association hosted two Business Breakfast events for key figures from business and local government. The first Breakfast on Thursday considered the importance of rural and coastal tourism to Cornwall’s economy, with the second focusing on a speech from George Eustice, the Minister of State for Environment, Food and Rural Affairs, on the future of food, farming and the environment – equally important to Cornwall’s economy as we count down to Brexit. It is always important for government ministers to have something positive to announce during their visit to help deflect any potentially difficult questions. For this minister it was the chance to unveil plans for the creation of two new Food Enterprise Zones – one involving a food artisan village in Bude (definitely helpful to have one located in North Cornwall) and new dairy production facilities at Trewithen Dairy. Despite scenting a slight whiff of opportunism at the decision to make the announcement during his speech at the show, both look like positive projects which will hopefully benefit Cornwall’s economy. Just to make it clear, my reason for not attending this year’s show was not because I am fed up with the event; it was because I was finishing my contract with Kernow Clinical Commissioning Group. As I said previously, I have had a great time working with the team during my first post council job and will certainly miss them. 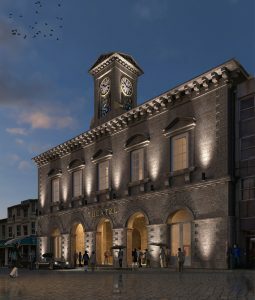 Next week I start a new project working with the Hall for Cornwall team to help keep local people and businesses informed about the progress of the exciting restoration project. The support for the last week of events, and certainly the emotion of the final performance featuring the incredible People’s String Orchestra, demonstrated just how much love and support there is for Cornwall’s theatre. I feel very privileged to have the chance to be part of the team telling this next chapter of the HFC story and am looking forward to highlighting the key moments of the journey.